So you have your perfectly painted room, the best furniture (you must have been shopping at Horizon Home Furniture! ), and a great arrangement. Is your room is still feeling boring, bland, and uninspiring? To complete your room you need to finish it with the right accessories that will bring interest, balance, and unique flair to your home. If you are feeling lost with how to add those perfect finishing touches, read on for some great ideas! When you have spent time decorating the base of your room but have neglected the walls, your room can be lackluster. Artwork and wall decor fill in the blank wall spaces in your room, add in color, and can really put your personality into your home. Do you love bold, black and white photographs? Get one printed and framed in a large size to make a dramatic impact on a whole room. Or group together smaller prints to form a wall of visual interest. Artwork can really make a room, and a dramatic painting can transform a just OK room into something that really wows your guests. Horizon Home Furniture is always getting in new, amazing art and wall decor, so come back often to fill your walls! Your room needs to be anchored, and a rug is the perfect vehicle for grounding any furniture pieces and adding in color and pattern. Choose a larger rug than your furniture arrangement to give your furniture the base it needs to really shine. If your room is filled with neutral furniture, consider a brightly colored rug to add in great color and give your room a little more punch. Using a patterned rug can also help add in design interest, and you can choose from a wide range of geometric patterns, traditional designs, and whimsical abstract colors. A rug can make a large visual impact in any room, so choose something that you love to complement your style and your home. Almost any room can be enhanced with the softness and color that pillows can add. If you have a large, light-colored sofa, an array of boldly patterned pillows can completely change the look, add in depth, and make your room seem more finished. Add in some small patterned pillows to your bed to spruce up plain bedding, and add in pillows to a bench to provide welcoming, comfortable seating. Pillows are a great way to change up the look of your room as well, and a more traditional, classic style can be modernized with a bold, graphic collection of black and white pillows. Think of where you could add in some great new pillows around your home to accessorize and make your rooms anything but boring. Do you have a beautiful collection that is gathering dust in a closet or basement? Display it! Many collections create visual interest that is unique and adds character to your home. Do you have unique glassware, pottery, or shells you have collected? 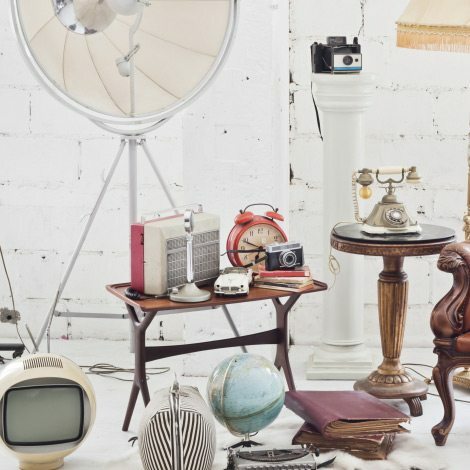 Or do you have an amazing collection of vintage items that you love to look at but never use? Display them, either on shelves, a table, or in frames to really get to enjoy them and fill in some blank space. A colorful collection of canisters, old watches, vintage cameras, postcards, really anything that you love can look beautiful grouped intentionally in a beautiful display. Plus, no one else will have the same decor as you if you choose to use a carefully curated collection! Do you want to infuse a stark room with a dose of natural beauty? Plants offer a great way to do this, and add in great color and texture to any room. A huge tree can draw the eye upward in a room with high ceilings, and fill in open space. Smaller plants can be sprinkled throughout a room to add in pops of lush green, and make your space come alive. If your room has a lot of hard lines, and sharp corners, plants can add in natural softness that contrasts great with a lot of new modern styles. Plants make a room come alive, and can be a welcome addition on a cold or gray day. They also pair wonderfully with a bright white interior, and mixing them with natural woods creates a beautiful palette for the modern home. Do you have a corner that could come alive with the addition of a plant? Or a blank wall where you could use a hanging planter system to create a living piece of great natural art? Bathrooms are another great place where plants can thrive in the humidity, and add in some design interest. Even if you don’t have a green thumb, succulents and cacti are widely available and require little more than sunshine and the occasional watering. Along with plants, fresh flowers always add in a punch of color and vibrancy. Tiny bud vases that hold just one or two stems allow you to spread out a bouquet, and add in color all around a room. Yes, you need lighting to brighten up your space, but even when they are turned off, lamps and lights can make a big design impact. A huge chandelier or pendant light will look just as spectacular during the day, and can create a focal point in an otherwise boring room. Lamps can fill in side tables, buffets, or bookshelves that need some height and interest. Think outside the box, and consider using string lights indoors, or small decorative lights around a plain room. Sconces that are affixed to the wall can serve double duty as lighting and art, and there are many new, interesting designs to choose from. Yes, books should be read, but they can also make great decor pieces. If you are storing away a huge library in boxes, you are missing out on not only seeing your favorite titles, but a design opportunity. Bookshelves make a room feel warm, lived-in, and comfortable, and the rows of book spines add in color and texture. Bookshelves can line a whole wall, surround a doorway, or lay low beneath a row of windows. Even if you don’t have a massive book collection, a few books stacked on a shelf or a coffee table can look great—especially when a small vase or sculpture is placed on top. Books in the bedroom can not only encourage a great reading habit, but they can fill in blank spaces. Larger books can be displayed or stacked, and might encourage guests to start browsing! A rectangular room with rectangular windows can start to look a little boring and repetitive. Soften the lines of your windows with curtains or drapes that can add in texture, color, or pattern. Match the existing color scheme in your room or go for something completely different and unexpected. A bold pattern can look great around a window, or an unexpected color can define a room. Hang your drapes or curtains high, near the ceiling, even if your windows are not that big. This will draw the eye up and make your room appear larger. Also hang curtains wider than the window, so they don’t cover the view while they are open and make the window appear larger and more impressive. Thick, heavy curtains can be dramatic, while a sheer, lightweight fabric can add a breezy, airy look to a room. 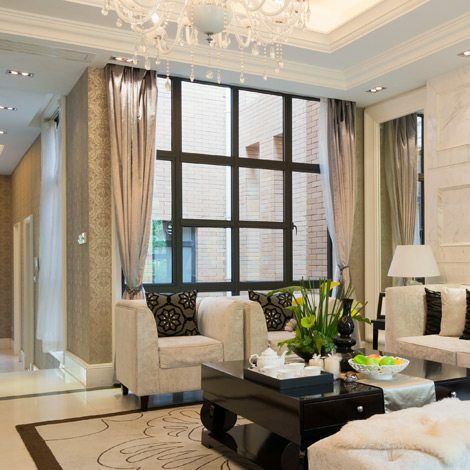 If your windows could use some design, add in curtains to help the look of your whole room. Mirrors are a great decor item that can add interest and increase the light in a room. A mirror can bounce the light from a window across the room to lighten up a dark corner. A mirror can also fill a blank or awkward space on the wall to pull a room together. Another great way to use mirrors is to choose an oversized one and lean it up against a wall in a boring corner or blank space. Think of mirrors as more than just a way to check your hair in the morning—use them as a great way to add in design to a boring room. Horizon Home Furniture has a great selection of mirrors that are always changing! So banish boring rooms by layering in accessories! When you want the best selection of designer pieces at outlet prices, you have to check out Horizon Home Furniture! In addition to all of our accessories, we have the best furniture for your living room, dining room, or bedroom—shop our store in Atlanta today!